This month I have my hands full with NaNoWriMo and I'm attempting to write 2x 50,000 word novels in one month. Crazy me! So I wanted to use this opportunity to round up some of my favourite interracial / multicultural reads of 2013. I've read so many books I've loved this year. Here is a selection of a few I know you'll enjoy. Three Jamaican women walk a tightrope of decisions when their lives are derailed by blackmail, deceit and infidelity. JUSTINE CHARLES, sensible and self-contained, battles an addiction which could destroy her marriage, reputation, and relationship with her daughter. DIONNE JONES, an aggressive go-getter, takes risks that cut a trail of devastation through her family and business. KYRA MILLS, struggling single mother, is crippled by debt, bad judgment and destructive choices. Can two of the long-time friends survive startling revelations involving their partners? And will the other push her obsession to the point of danger? Aurora Devine's libido has been asleep for over eight years. She's had the curse of not being able to have the big O since running away from her Master, Felipe Santiago Castro. The last time she came at the hand of a man was with Felipe. She's convinced the only way she can find peace of mind and pleasure is to go to Once Upon a Dream Fantasies. Aurora signs up, asking for everything she's lost eight years before to be fulfilled in a fantasy. Felipe wants to show Aurora that he's the only fantasy she needs. He'll do anything to have her back in his life as his submissive. He plays along and gives her the fantasy she wants, but in the end hopes she'll realize that her submissiveness calls to his dominance and they're a matched pair. This light romance takes place in the present day in a mid-size college town. The story revolves around personality conflicts and confusion between close friends as they go through a period of personal and relationship evolution.Crystal Taylor has always described herself as big, bright and boring. Her two best friends since high school are the dazzling siblings, Shonté and Key Emerson. They've always relied on her practical guidance to keep them on track. But things are suddenly changing. Shonté is in hot pursuit of a married man; Crystal and Key stumble into an impetuous one-night stand; and Crystal decides on a makeover that is making men take notice! Crystal is determined that none of this will change her relationships with her friends.Key finds that one night wasn't nearly enough with Crystal, but she is adamant that they can't be friends and lovers at the same time. 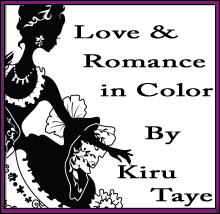 Columnist: Kiru Taye is the award-winning author of His Treasure. She writes historical, contemporary and paranormal romances. Her stories are sensual and steamy, her characters passionate and sassy and her settings atmospheric and exotic. When she’s not writing, she’s reading, hanging out with family/friends or travelling. Born in Nigeria, she currently lives in the UK with husband and two children.